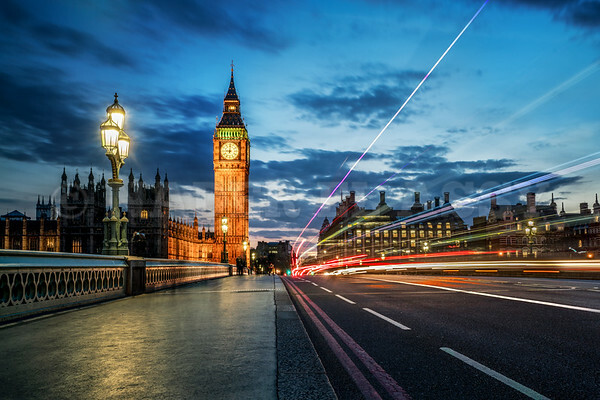 In this photo I captured motion during a lovely blue hour at the Westminster Bridge in London. Once the sun sets down and the blue sky appears, several photography opportunities comes up. I usually use the city lights, buildings and lights of traffic to build colors contrast between the elements and the blue sky. I captured several photos with different compositions and ideas for and from the Bridge during my visit to London in 2016. Although it was a very quick trip, but it was very successful in terms of photography. I have made the effort to plan for that trip very well prior travelling. Have a look on my post about Travel Photography planning, you may find it useful. Read it HERE. 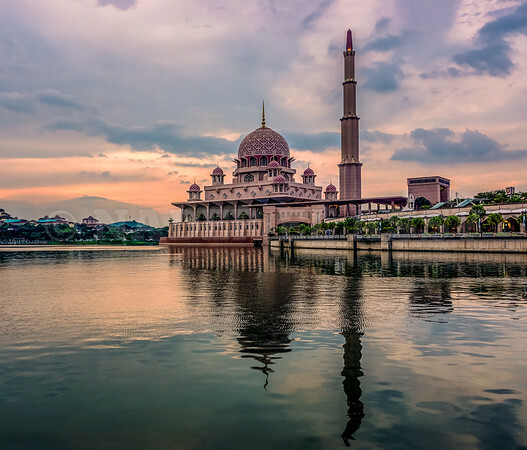 Here is a photo I took for the well-known Mosque in Putrajaya, Malaysia. I took the shot few years back and I didn’t get a chance to process it yet. But this week I found it as a very good candidate to test a new kit of processing tools. I produced this photo from a single RAW file using Adobe Photoshop. But this time I processed it differently, I used Sleeklens.com Photoshop workflow actions bundle for landscape. I really liked how the actions bundle could give the entire image a decent boost in colors and contrast. Get the bundle I used from HERE. Planning Travel Photography starts by knowing the landmarks of the destination you are visiting, which will greatly help you get the most out of your photography trip. Would you imagine a Photographer visiting London without taking photos for Big Ben, London Eye or the Tower bridge? Of course not. Any photographer visiting such a famous city will most probably capture the Iconic Landmarks and places around the city. It’s one of the very early planning steps finding out where those Landmarks are located and how far they are from where you will be staying. And here comes the first benefit of knowing how to store these locations in your map and learn how to use them . إن معرفتك بمعالم المكان الذي ستزوره سيساعدك كثيراً في الحصول على أقصى استفادة ممكنة من رحلة التصوير الفوتوغرافي. هل لك أن تتخيل مصوراً يزور مدينة لندن دون التقاط صوراً لساعة بيغ بن أو لندن آي أو تاور بريدج؟ بالطبع لا. فإن أي مصور سيقوم بزيارة تلك المدينة الشهيرة لابد وأنه سيلتقط صوراً للمعالم المتميزة في جميع أنحاء المدينة. في الواقع هذه أحد أولى خطوات التخطيط المبكرة للرحلة، فيجب معرفة أين تقع تلك المعالم الرئيسية وما مدى بعدها عن مكان إقامتك. وهنا تأتي الفائدة الأولى لمعرفة كيفية تخزين هذه المواقع في خريطتك الخاصة. This is to announce my coming soon series of blog posts about Planning Travel Photography. I will share with you my thoughts about how I got the most out of my latest and quite short photography trip to London. And you can imagine how difficult it can be photographing in a big city like London while all the time you have is less than 72 hours only. However it was not that difficult in reality just because it was well planned. And I ended up having much more successful photos than I have even wished for. قريباً بإذن الله سأقوم بنشر سلسلة من المشاركات عن التصوير أثناء السفر. وسوف أطلعكم على بعض أفكاري وتصوراتي حول كيف استطعت الحصول على أقصى استفادة من رحلتي الأخيرة للتصوير في لندن. يمكنك أن تتخيل مدى صعوبة الذهاب للتصويرفي مدينة كبيرة مثل لندن، في حين أن كل الوقت المتاح لديك أقل من 72 ساعة فقط. ومع ذلك لم يكن الأمر في الواقع بهذه الصعوبة، والسبب كان فقط التخطيط والاستعداد الجيدين للرحلة وللنوعية وأماكن الصور التي أرغب في التقاطها. وفي النهاية تمكنت من الحصول على عدد كبير من الصور الجيدة وكانت أكثر نجاحاً مما كنت أمنى قبل السفر. 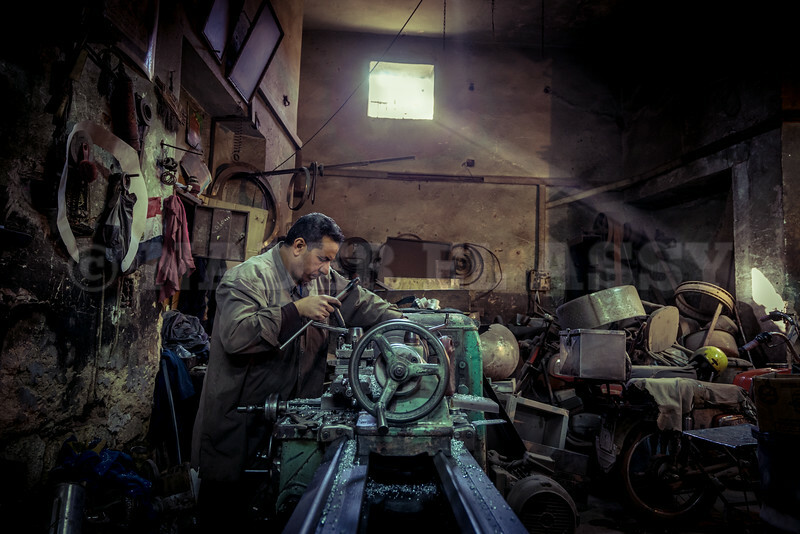 I had a great experience while walking around the fabrication workshops in the old Islamic Cairo. Looking into the eyes and emotions of the working people has a different feeling, especially for an architecture oriented photographer. I was a little hesitant (and shy, may be) to face people and ask them for a photo. Many people don’t feel comfortable when you aim the lens towards them. However, I was supported by few of my friends that were used to practice street life photography, that really helped breaking the ice between me and the worker. لقد كانت تجربة رائعة لي عندما ذهبت في جولة بين ورش تصنيع المنتجات المعدنية بشارع المعز لدين الله الفاطمي بالقاهرة الاسلامية. فكان للنظر في عيون وتعبيرات وجوه العمال الحرفيين أثرا مختلفاً على شخص مثلي، اعتاد أن يلتقط صورا معمارية. وشعرت كثيرا بالتردد والخجل أحيانا من مواجهة الأشخاص وأن أطلب منهم أن ألتقط لهم صوراً. فالكثير من الناس لا يشعر بالارتياح إذا وجهت عدسة الكاميرا تجاههم. ولكني كنت مدعوماً ببعض أصدقائي ممن اعتادوا على ممارسة تصوير حياة الشارع، فكان لهذا أثرا كبيراً في كسر الحاجز النفسي بيني وبين من قمت بتصويرهم. 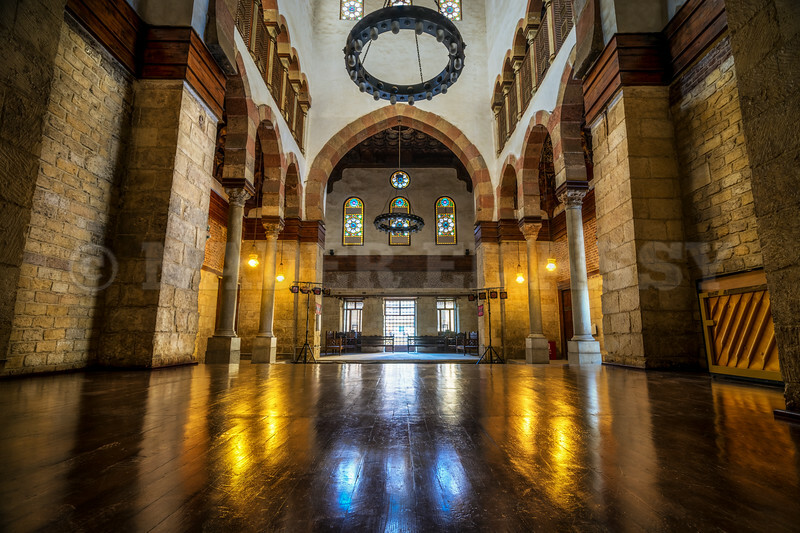 This is the reception hall of Prince Beshtak Palace which is located in Al Moez Street in the heart of the Islamic Cairo. It was built by the Mamluk amir (prince) Beshtak in 1339 (677 years ago). The most impressive surviving part of the palace is this large reception hall. The hall features a wooden ceiling, stucco windows of colored glass, and a fountain of inlaid marble in the center (not shown in this photo) and the wooden floored stage. تم التقاط هذه الصورة في قاعة الاستقبال بقصر الأمير بشتاك. يقع القصر في شارع المعز لدين الله الفاطمي في قلب القاهرة الإسلامية. أمر ببناء القصر الأمير المملوكي بشتاك في العام 1339 ميلادياً، أي منذ حوالي 677 عاماً. ويلاحظ زائر المكان أن هذه القاعة الواسعة هي الأكثر جاذبية بين ما تبقى من أجزاء القصر. وتتكون هذه القاعة من سقف خشبي ملئ بالنقوش، ونوافذ صنعت من الزجاج الملون، وفي منتصف أرضيتها توجد نافورة صغيرة من الرخام (غير ظاهرة في الصورة). وأخيراً يوجد هذا المسرح الخشبي والذي ترتكز عليه الكاميرا في هذه الصورة. 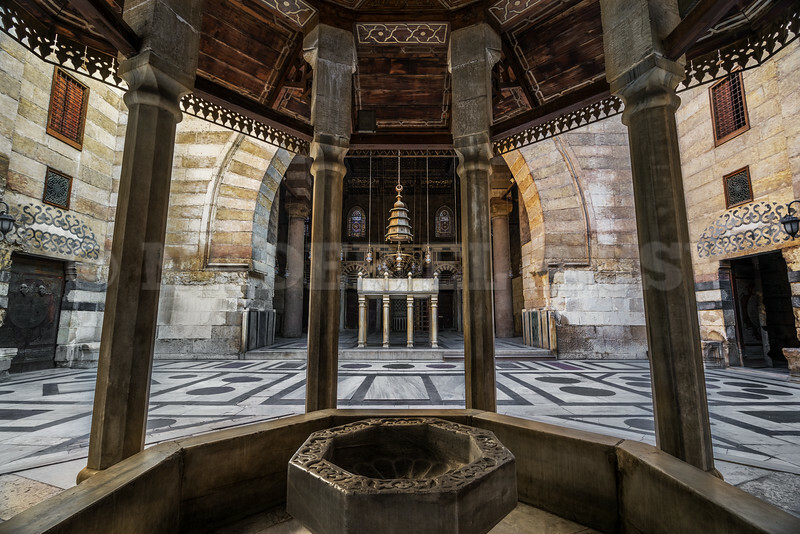 Sultan Al Zahir Barquq Mosque is one of the most famous mosques remaining from the Fatimid Dynasty rule of Egypt. Today it stands at the heart of the Historic Cairo among four other historical buildings since about 630 years ago. The place is also known as being Madrasa (school). As almost all the famous buildings constructed in that era, it’s formed out of huge rocks forming high walls full of arches that were well known in the Islamic Architecture. صورة من مسجد السلطان الظاهر برقوق، والذي يعتبر أحد أشهر المساجد الأثرية المتبقية على حالها من عصر الحكم الفاطمي لمصر. ويقع المسجد حالياً في قلب القاهرة التاريخية بمنطقة بين القصرين في شارع المعز لدين الله الفاطمي. وهو جزء من مجمع كبير، وتم بناؤه منذ حوالي 630 عام. ولهذا المكان عدة أسماء، فهو يعرف أيضاً باسم مدرسة الظاهر برقوق. ومثله كمثل باقى المباني الشهيرة التي أنشئت فى العصر الفاطمي، فقد تم بناء المسجد من الحجارة الضخمة مكونة حوائط عالية مليئة بالأشكال الهندسية المنحنية والزينات والزخارف التي اشتهر به قن العمارة الإسلامية في هذا الوقت. 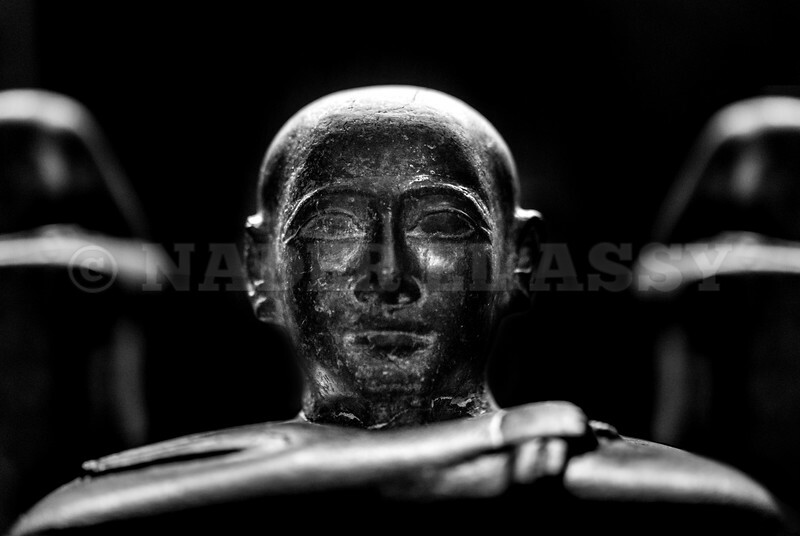 Captured this statue face coming from the past in the Egyptian Museum. Unfortunately I couldn’t identify whose statue it was. I hope the Museum authority adds more information about the museum contents. What really attracted me was the lighting conditions around the statue. It made a great setup for a nice portrait. قمت بالتقاط هذه الصورة لوجه تمثال قادم من الماضي في المتحف المصري بالقاهرة. ولكن للأسف لم أستطع أن أجلب معلومات عن هوية صاحب التمثال و القصة التاريخية حوله. وأتمنى أن تقوم إدارة المتحف بإدراج معلومات كافية عن كافة محتويات المتحف الثمينة. لكن بغض النظر عن المعلومات، فقد لفت نظري بشدة كيف أن الإضاءة المحيطة بالتمثال شكلت حالة فوتوغرافية جميلة. فقد كونت إعداداً رائعا لصورة بورتريه جميلة. This is an amazing Pharaonic Coffin in the Egyptian Museum. I stand in front of such monument thinking about the thousands of years it has survived since it had a dead body inside and buried in the ground until it rested under the beautiful lights in the Egyptian Museum. Amazingly this ancient piece of art has kept almost all the texture and lines along the year. The nose is probably the only area affected by age. مشهد جميل لتابوت فرعوني أثري في المتحف المصري بالقاهرة. أقف أمام مثل هذه القطع الأثرية أفكر بعمق في آلاف الأعوام التى مرت عليها منذ أن كانت المومياء بداخلها وتم حفظها فى مقبرة وحتى تعاقبت الأزمان ووصلت لنراها تحت هذه الأضواء فى المتحف المصري. ويا للعجب، فقد استطاعت هذه القطعة الأثرية (مثله امثل آلاف القطع) أن تحتفظ بمعظم تفاصيلها وجمال خطوطها عبر العصور. فى الغالب أن الأنف هي المنطقة الوحيدة التي تأثرت بمرور الزمن. 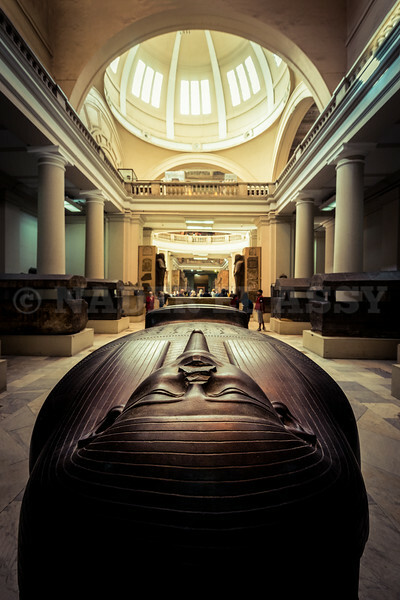 It was my first visit to the Egyptian Museum with a Camera. Although the place is full of usual scenes you see in museums, I was mainly thinking about creative photographic opportunities. 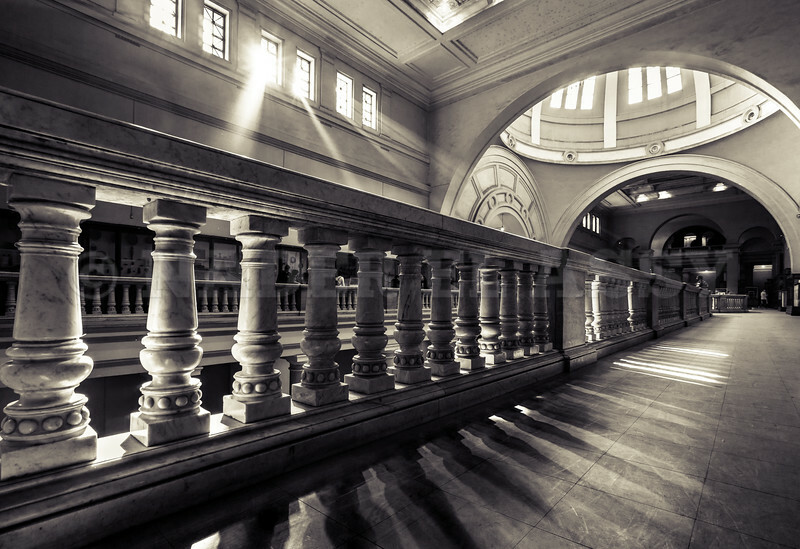 In this one I thought about capturing Light and Shadow in the Museum. I had the chance to capture many other compositions in the place, but I was curios to see how this one will turn to be. كانت هذه زيارتي الأولى للمتحف المصري بالقاهرة وبحوذتي الكاميرا. وعلى الرغم من أن المكان ملئ بالمشاهد المعتاد أن نراها في المتاحف كالتماثيل والدواليب الزجاجية، فقد كنت أفكر بالأساس في خلق صورة إبداعية قدر الإمكان. في هذه الصورة، كنت أفكر في كيفية التقاط اشعة الضوء الساقطة من النوافذ وكيف أنها تسببت في تشكيل هذه الظلال داخل المتحف. ومع هذا فقد أتيح لي أن ألتقط عدة تكوينات أخرى فى هذا المكان الساحر، لكني كنت متشوق لأرى كيف سيكون الشكل النهائي لهذه الصورة.